We're all coming around to the idea of a digital home and despite the complexities of networking and network applications, manufacturers like Western Digital are marketing entire ranges of network-ready media systems. The WD My Net N900 Central is the flagship model of its new My Net range that brings FasTrack networking, ease-of-use and a fleet of features to your home network. We've also reviewed the closest sibling to this model, the WD My Net N900, that forgoes the internal hard drive but features three additional Gigabit ports and an extra USB port. This wave of network-aware, media-serving devices isn't bringing us a great deal that's new. 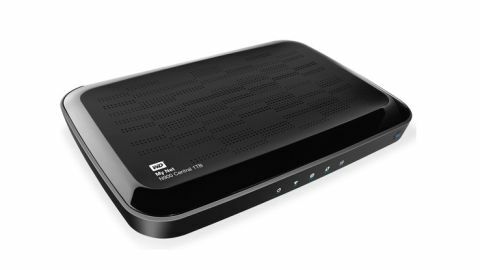 There are several devices like the WD My Book Live Duo, the Iomega TV with Boxee and D-Link ShareCenter that have been around for a while. But all are good examples of how traditional storage and networking companies are expanding into new areas. Arguably Western Digital is doing a better job than most and this latest push brings their networking technology right up-to-date. At its heart is a dual-band (2.4GHz and 5GHz) 802.11n router with a 3x3 antenna that is capable of delivering 450mbps connections in both bands, assuming your laptop is kitted out with the same. The other prime feature is that this unit comes packing an internal 1TB hard drive that can be used to store anything from media to files, which can be shared via numerous means around your internal network or externally over the internet to mobile devices and other computers. It's a comprehensive bit of consumer networking kit and it's designed to sit on top of an existing broadband modem. Despite all of this technology it remains as small as a standard router with all the antennas remaining internal. Installation can be done via a Windows install disc or it's just as easy to handle it via the web-based interface. If you've not picked up on it yet, we're impressed by the sheer quantity of features in the WD My Net N900 Central; that's despite it measuring 244x170x32mm and being a standard-sized router. Around the back are four Gigabit LAN ports plus an additional WAN port for cable-modem work. A final USB 2.0 port is there to expand storage via an external drive or add a network-shared printer or scanner. As is the trend there are no external antenna on this sleek unit and the front status LEDs are a toned-down blue affair and barely noticeable, which is probably the right approach for home units. A hard power-button makes it easy to power off the device when needed and the final physical element is a WPS button, if you use this easy-connect system. Under the hood is a dual-band (2.4GHz and 5GHz) 802.11n router with a 3x3 antenna array, which is capable of delivering 450mbps connections in both bands at the same time. Both bands can have their own SSID assigned, plus separate passwords using WPA1 or 2 encryption, personal or enterprise and on a mix of 20MHz or 40MHz multiplexed streams. Additional MAC filtering can be applied and Firewall rules, while basic parental controls can impose time limits and basic hand-listed HTTP filtering. When it comes to supporting dual bands we've seen a mix with some like the Asus RT-N56U offering simultaneous dual-band capabilities, to the Fritz!Box 3270 that only provides 2.4GHz or 5GHz support. This sort of splintered support without clear definition can be confusing, so it's great to see Western Digital making it clear across its range what is supported and at what speeds. This top-end model comes with a built-in 1TB drive that enables media sharing and general NAS support on your local network. For local media sharing it has a basic DLNA server and provides iTunes network sharing. It's also capable of serving files and streaming media over the internet via FTP and direct to mobile devices via its WD 2go app. Full IPv6 is implemented and a guest wireless zone can be set up that restricts local network access but with no other controls. Everything can be configured via the same web interface that's split into basic and advanced sections to offer clear guidance and warnings, along the top bar.